The Angelic Essence allows contact with spiritual wisdom. By creating mental clarity it empowers especially within relationships and stressful situations, and clears out past negative patterns. The Angelic Essence was made in Peru on the top of the sacred mountain, Putucusi, directly across from Machu Picchu. Right up until the moment of our death, the Angels are always attempting to inspire and raise our awareness to the spiritual — so that we will look up and embrace the Light. The Angelic Essence allows one to have closer contact with the Angelic realm. This Essence helps us to be more open to receiving from on high, the Angelic tones of inspiration, love, awareness, communication, guidance and instruction which can lead us to an infinite range of potential possibilities in our mortal lives. 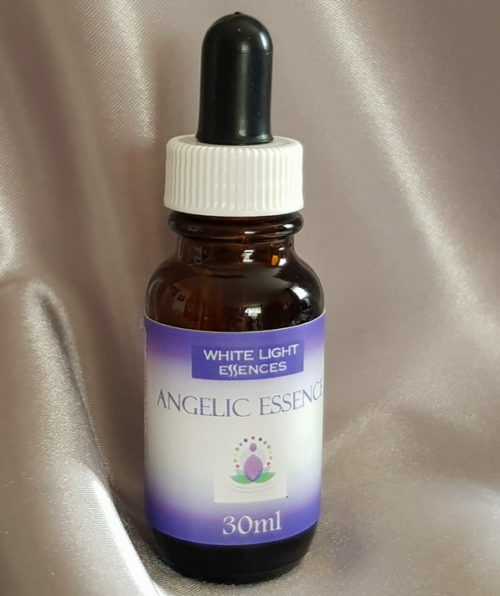 The Angelic Essence brings the energy from heaven directly down to earth, uniting the two. This remedy enables one to aspire beyond the physical while keeping us connected to the mundane. It helps us realise that the spiritual exists in everything and to transcend the deceptive illusion of the physical. One can also invoke protection of an Angelic kind and of any specific Angel by taking this Essence.